Everything below, until present time, is important information for all users to read, as it is all major events that have happened in the lifetimes of your characters. The events represented below take place from 4 years ago. The legend began when a young princess in Hyrule had seen visions of an evil god taking hold of the Triforce and spreading evil across the land. When she had warned her father of these premonitions, he had not believed her, saying that it was only a bad dream. Several weeks later, the King of Hyrule had passed unexpectedly. Zelda had no choice, but to take matters into her own hands. Now that a coronation was drawing near, she would have to make decisions for Hyrule that impacted everyone. She, along with the Sheikah, had set out to find the Legendary Hero. Once the hero had been found, it was time to vigorously train as they awaited for a dark evil to approach. In the shadows, a young man named Marik had been possessed by the exiled god, Seith. Using him as a puppet, Seith controlled Marik to search for his soul shards laying dormant in the depths of each dungeon of Hyrule. Meanwhile, the King of Labrynna, Galadhion has been setting a plan in motion to take control of Hyrule by arranging a marriage between Princess Zelda and his son, Prince Perseus before the date of her Coronation so that she holds no power when she becomes Queen. During the Ceremony of the Reveal that Link, the Legendary Hero had been found, it was revealed publicly that Perseus and Zelda were to be married. King Galadhion had gotten permission from the Late Hyrulean King to watch over Hyrule until the date of Zelda's coronation, and had then decreed that if Zelda and Perseus did not marry, Link would be executed. This was do to King Galadhion's suspicions of a budding romance between the two, since it had been tradition for centuries that the Hero and Reborn Goddess would fall in love once more. During the day of the wedding, many of Zelda's allies, including Perseus himself had devised a plan of escape, however, in the process, Zelda had to fake her death in order to safely create a distraction for the others to escape, as they were then exiled. One of Zelda's decoys had swapped places with her, sacrificing herself so that the princess may escape unharmed. She, however, had to take on an alter ego, disguising as a Sheikah using her magic, as it was accustomed for all members of the Royal family to do so. This was because it had proved to be incredibly helpful during the Ocarina of Time era. She was not allowed to reveal her identity to anyone. The Coalition (which included Link, Prince Perseus, King Asthar of Holodrum, Aryll (Link's sister), Saria, and several others, had traveled as quickly as they could to the land of Holodrum. Because Galadhion had control of Hyrule and Labrynna, they could not risk their safety being within those territories. Zelda had met up with them shortly after, having to keep her identity a secret as she watched her friends grieve over her "death". During this time, as the alliances between the three Kingdoms began to diminish, Seith was able to retrieve every shard of his soul, and thus being able to release himself from the prison under the Light Temple. He was able to then completely take over Marik's body, using it as a vessel to release himself into the world, but in doing so, he created a rift between the Sacred Realm and the World of Light, opening a bridge between them to allow all other Gods and Goddesses who were trapped in that world to be able to freely cross over. When Hylia had denounced her divinity to use the Triforce and seal away Demise, she had created a separation between the Sacred Realm and the human world, making it so that Gods and Goddesses could no longer enter freely to use their magic at will. They were to be sealed in the Sacred Realm for the rest of eternity. When this bridge had opend up, many were very angry with Hylia's actions and began to seek out her incarnation for revenge. With armies ready, and courage held high, Link had joined the front lines to face the gods to defend his world. However, when the disguised Zelda had joined by his side, Seith could sense her presence, and had immediately revealed her to the other Gods. It was clear now that they were vastly outnumbered and overpowered, and as the battle commenced, many died within seconds. Fearing for the worst, Link did the only thing he could think of to save his people - he prayed to the Golden Goddesses. Despite their disappearance from the land for uncounted millenniums, he prayed for any answers to save the Land of Hyrule, and the world that surrounded them. Then, unforeseen by many, the very Goddesses appeared. In their short time that they had visited, they did three things to punish each of the golden trio. First, they sealed the gods and goddesses back into the Sacred Realm, and banished Seith into a forsaken dimension which can only be compared to eternal suffering. They then exiled Marik from the Land of Hyrule, claiming that he did not belong there since he was born to the mainland away from the Isle. Second, they punished the Goddess Reborn, for being foolish in her ways, as to leaving a trail for Seith to be able to escape. They condemned her family's birthright to the Triforce of Wisdom, and then shattered the Triforce in its entirety into a thousand different shards, scattering them across the entire Isle. This would put blame on Zelda for the loss of their ancient relic, so that she may be publicly disgraced by her people. And Third, as punishment for failing to protect the Goddess, Triforce, and the Land of Hyrule, The Golden Goddesses had sealed Link away in the Prison of the Sacred Realm in Seith's Place, leaving him to be locked in solitude for Eternity. Because he cannot die while imprisoned, the cycle of the Hero being reborn would be broken, as a new hero cannot come if the previous one has not died. After the rejection of the Royal Family by the Goddesses, many Hyruleans had lost their faith and trust in their leaders. When Zelda had gone to be coronated as Queen of Hyrule, very few people had shown their respects. Hyrule began to fall under turmoil due to the increasing disloyalty to the Royal Family, while many even made threats to Zelda, saying that she no longer belonged in Hyrule. Civil Wars broke out over the next several years, and many resistance forces had forced their way into the castle, forcing Zelda and her advisers out. She had been removed by her own home, and many do not see her as a Queen any longer. An alliance has finally formed between Labrynna and Holodrum after a millennia of feuds. As Prince Perseus had taken the throne and is now King after his father's passing, he and King Asthar had signed a treaty of peace. Meanwhile, Hyrule is in utter chaos, having no forms of law since the Royal Family had been forcefully removed. Anarchy has fallen over the main kingdom, while Zora's Domain and the Goron City have been doing all they can to maintain control of their people. When the shards of the triforce had scattered across the island, many of them had been drawn to people who had most represented their affinity, such as wisdom, power, or courage. These shards have given the people who have received them the ability to use magic. The more shards collected by a person, the more power they have. Many people have formed guilds and fellowships, containing a majority of people with the same agenda in mind for the Triforce Shards. While some are collecting them in order to become the most powerful guild, others are trying to collect them to restore peace to Hyrule. In Zelda's time away from the throne, she had gathered many followers who still believe in her cause, and want nothing more than for peace over Hyrule once more. 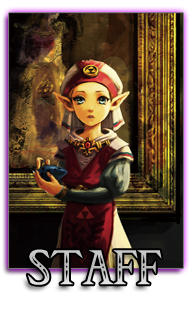 She has created a fellowship known as the Heroes of Hyrule, and their main goal is to collect the shattered pieces of the Triforce to once reunite it once more and bring peace, as well as unseal Link from his prison.